MICHIGAN TRUTH SQUAD ANALYSIS: "Michigan kids don’t need teacher strikes" and "School safety"
Truth Squad call: No foul. Proposal 2 would "grant public and private employees the constitutional right to organize and bargain collectively through labor unions." According to a report by the independent, nonpartisan Citizens Research Council of Michigan, Proposal 2 is an effort to combat recent actions taken by the governor and Legislature to restrict the bargaining power and costs of public sector workers. Those recent actions include restriction of teacher tenure, requiring public employees to pay more for health-care premiums and prohibit minimum staffing levels for police and firefighters. Further, Proposal 2, would, according to the Citizens Research Council, "effectively restrict the ability of the Michigan Legislature to enact right to work legislation." Citizens Protecting Michigan’s Constitution is a coalition of business groups, such as the Michigan Chamber of Commerce, opposing a variety of ballot props this year, including Proposal 2. Protecting Michigan Taxpayers also opposes Prop 2. Its treasurer is Jared Rodriguez, who is president of the West Michigan Policy Forum. 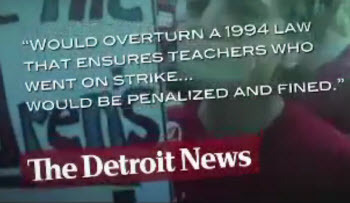 Questionable statement: "Proposal 2 repeals the law that fines teachers and unions for illegal strikes. We’ll get more of them …"
These claims are stated as fact. The actual concrete results if voters pass Proposal 2 are far from certain. In short, the Citizens Research Council concludes that passage of Proposal 2 "promises to bring uncertainty to the management of governments throughout the state and litigation for many years to come." Actually, Proposal 2 specifically states that laws "may" be enacted to "prohibit" public employees from striking." But Michigan’s top elected legal officer, Attorney General Bill Schuette concludes that the current state law which fines teachers for illegal strikes is one of some 170 state laws that would "appear" to be abolished, "in whole or in part," if Proposal 2 passes in November. Eric Lupher, the Citizens Research Council analyst who co-wrote its report, concludes that the question of teacher strike rights is one of many issues that would be decided by ensuing litigation in Proposal 2 passes. Questionable statement: "Worse, Proposal 2 could prohibit schools from removing employees with criminal records." Here voters are faced with the distinction between two words – "would" and "could." Schuette’s analysis of Proposal 2 also lists the Revised School Code Act, as among those 170 which could be abolished "in whole or in part." The Revised School Code includes provisions on criminal history checks for employees and a prohibition on employing people with certain criminal offenses. Given the expert conclusions that passage of Proposal 2 could likely result in lengthy legal battles and thus throw the rules of public employee rights and management into uncertainty, it’s fair for the ad to conclude that the ultimate state and local rules regarding employees with criminal records "could" change. Questionable statement: Proposal 2 "… would eliminate safety rules for school bus drivers …"
Schuette’s list of impacted laws, does, indeed, include the Pupil Transportation Act of 1990, which includes provisions on school bus safety education. It is among the many laws open to considerable uncertainty and possible legal battles if Proposal 2 passes. But the wholesale elimination of bus driver safety rules is not an absolute fait accompli. Questionable statement: Proposal 2 repeals "the reforms to save taxpayers money on pension and health benefits." The two sides agree that this is one of the key motivations of Proposal 2 proponents. Schuette’s analysis of laws that could be repealed in whole or in part includes recent retirement system changes. Likewise, an internal memo from the Michigan Education Association (which supports Proposal 2) clearly states that recent pension, pay and benefits reforms would be rolled back if the measure passes. Specifically, the MEA memo states that: Any "rates of pay" lost in recent legislative reforms "would be reinstated." "… (P)rovisions regarding health insurance plans and employee contributions would be restored." "Health insurance increases that were passed on to the (MEA) members would also be bargained back retroactively." Overall impression: Since there is not clear legal agreement on what Prop 2 will or won’t do, the use of the word "could" do something is tough, but in-bounds. The use of "would" evokes certainty, but with the language of Proposal 2 leaving so much open to interpretation by the courts, it is possible that the changes envisioned in these ads would happen. Further, there is little or no debate on Proposal 2’s intended impacts on teacher pay and benefits issues. And while still making the kind of breathless and nonspecific claim common in some political advertising – "we’ll have to pray for (kids’) safety" -- these ads do not veer into the same level of hyperbolic scare as a previous ad suggesting Prop 2 will result in sexual predators in the classroom. In short, a vote in favor of Proposal 2 can be seen as a vote in favor of the potential for increased teacher pay, benefits and bargaining power. A vote against Proposal 2 can be seen a vote in favor of recent restrictions on teacher pay, benefits and bargaining power passed by the governor and Legislature. Foul or no foul: No foul. Given the likely uncertainty of the legal questions at hand, voters are advised to carefully consider whether they think Proposal 2 "can," "will," "should," or "should not" result in the policy changes envisioned in these ads. The Center for Michigan (the parent company of Bridge Magazine and the Michigan Truth Squad) has been financially supported by a wide range of corporate and foundation supporters. We are grateful to all funders for helping us create and grow a new nonprofit journalism service for Michigan citizens. Those funders have absolutely no role in the editorial decisions of the Michigan Truth Squad or Bridge Magazine. Bus drivers are under CDL regulations. ALL bus and comercial drivers must meet these requirements. The ad claiming PROP #2 will repeal CDL requirements is 100% false. Amazing. You base your statements on the REPUBLICAN attorney general's opinions. Gee, I wonder which side he's on. In 1979 the State Police had the same Collective-bargaining issue on the ballot. It was passed with no problems the state police have had collective-bargaining since that time. There've been no strikes and the State of MI has note uttered any problems. What's the difference between the state police and everyone else in the state of Michigan?